All of the dog art collage works listed below are the original pieces. Each is a one of a kind work of art. Only one available. If you have any questions at any time please email or phone. If you are interested in having me create an original collage commissions start at $499.00 - click here. If you are a retailer interested in offering my line of dog art prints through your store please contact me direct at 812.859.4191 for wholesale distributor information. This category (below) is for my ORIGINAL pieces. 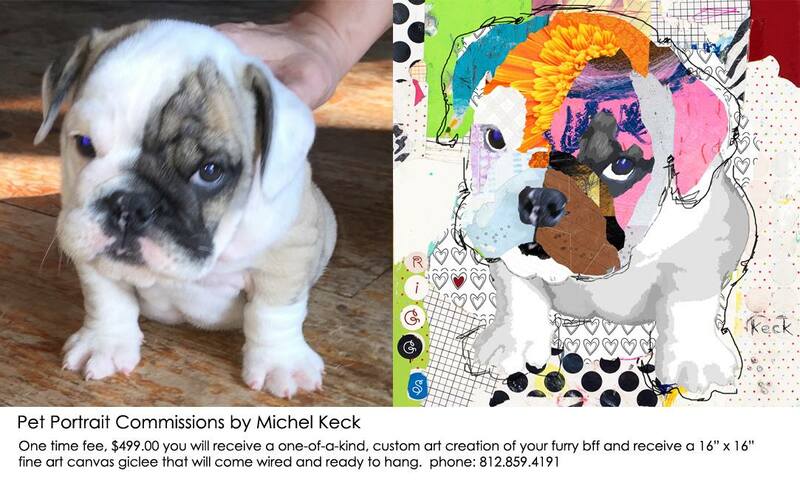 To view ALL of my giclee prints of my dog collages, starting at $49.00, CLICK HERE. Original Mixed Media Collage - German Shepherd - 16" x 20" Original Mixed Media Collage - Greyhound - 16" x 20" Original Mixed Media Collage - Doberman - 16" x 20"
Custom One-Of-A-Kind Dog Art Portraits by Michel Keck. The sweet little image above is the one of a kind, custom dog art portrait I created for my collector Niki and her husbands fur baby - Mr. Riggs!